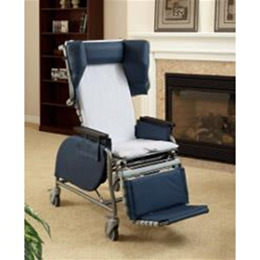 The Broda Midline Full Recliner offers superior comfort and versatility, making it ideal for various settings An excellent choice for a full positioning chair, it is a less expensive alternative to the Broda 785 and Elite Chair line. Medium to heavy levels of nursing care. With up to 38° of seat tilt and up to 90° of back recline, the Midline offers an infinite range of positioning options for resident comfort.